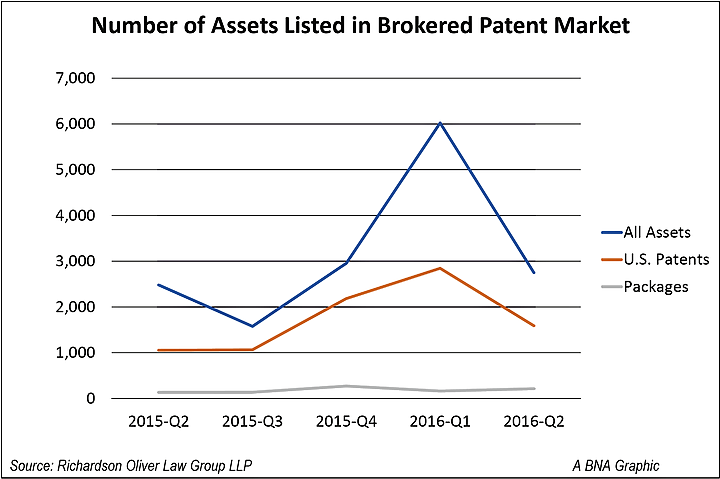 Aug. 1 — Patents and patent applications covering cardiovascular devices, digital mapping and wearable technology were sold through the brokered patent market during the second quarter of 2016, according to data provided to Bloomberg BNA. The median asking price for all asset types, including both U.S. and foreign patents and applications, rose slightly during the quarter to about $167,000, compared with about $124,000 in the first quarter of the year, according to the data from Richardson Oliver Law Group LLP, which advises companies that want to acquire patents and has visibility in much of the brokered market. The median asking price for U.S.-issued patents was $250,000 during the quarter, up from about $208,000 in the prior quarter. 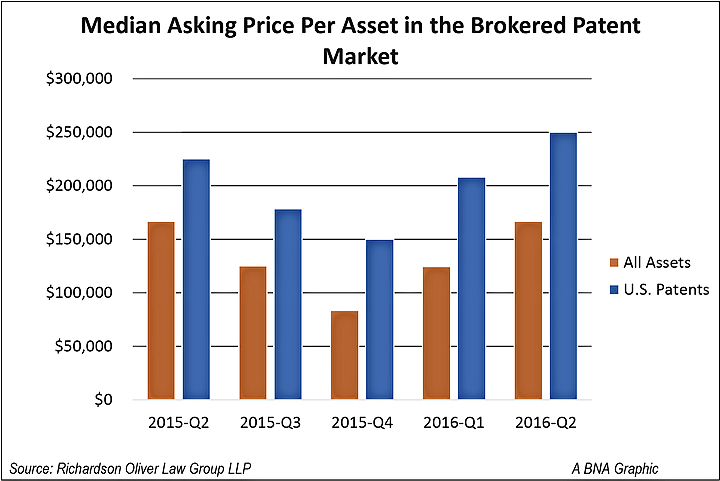 That’s the top median asking price for U.S.-issued patents in the brokered market since the second quarter of 2014. 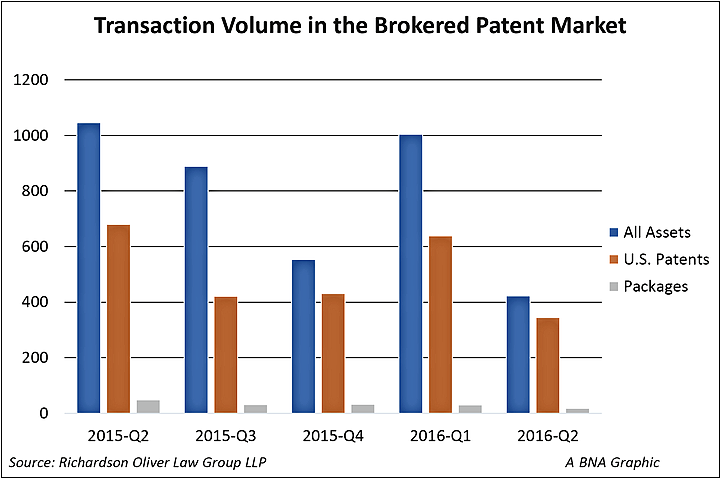 The brokered market comprises just a small portion of the overall market for patent sales between companies but can offer insights into broader trends. Brokers can help companies acquire patents in fields where competitors and likely legal adversaries operate, giving them defensive leverage if those companies go after them for alleged infringement. 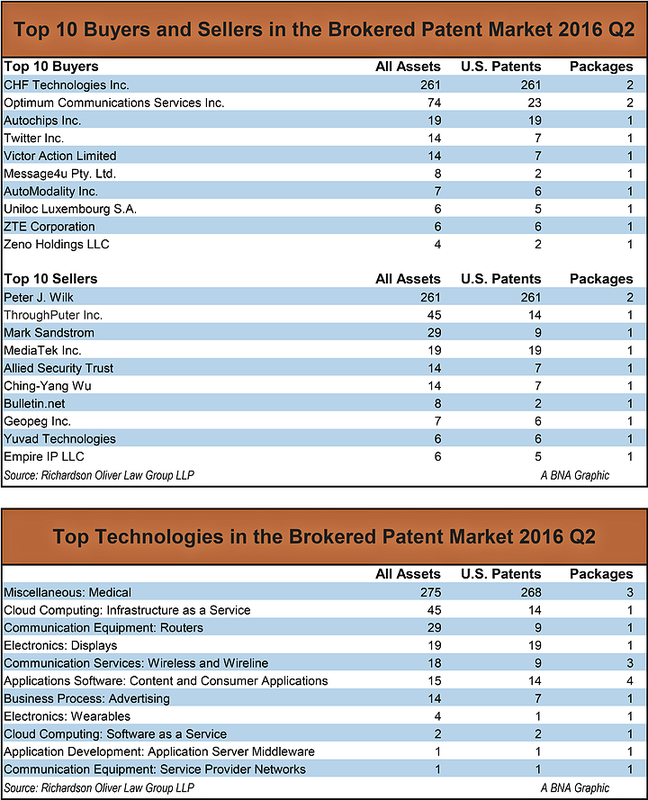 Patent holders made sales from 18 patent packages containing 423 patent assets and 345 U.S.-issued patents during the quarter. That’s down from the prior quarter, when patent holders made sales from 30 packages containing 1,005 patent assets and 639 U.S. patents. Patent assets include foreign and domestic patents and patent applications. ROL Group tracks the reassignment of patents from various listed packages to identify when a sale is executed. Due to a lag in recording reassignments at the Patent and Trademark Office, ROL Group assumes that a given package is sold if any of the U.S. patents listed in the package are shown as reassigned in the PTO's system. Patent holders listed 2,749 patents and patent applications in 214 packages, including 1,590 U.S.-issued patents, on the brokered market during the quarter. That’s down significantly from 6,023 total patents and patent applications in 164 packages listed during the prior quarter. Those packages contained 2,846 U.S.-issued patents (108 PTD, 6/6/16). Possibly the largest asset transfer during the quarter involved two packages containing 261 U.S.-issued patents sold by Wilk Patent Development Corp. and its president, Peter J. Wilk, to CHF Technologies Inc., which does business as BioVentrix Inc., a cardiovascular device firm. Wilk previously sought to sell about 25 cardiovascular patent assets on the brokered market through ICAP Patent Brokerage, according to a September 2015 press release. The patents “pertain to heart and vascular surgery, cardiothoracic surgery, coronary artery bypass procedures” and numerous other cardiovascular procedures, according to the release. Because of the PTO recording lag, it’s not clear how many of the Wilk patents BioVentrix actually purchased. Twitter also purchased patent assets from the defensive patent aggregation firm Allied Security Trust during the quarter. The package included 14 patent assets, including 7 U.S.-issued patents.